In earlier postings I made the conjecture that slime molds may take to the air by filling a small sac with methane. Been slime molds they could also gather in large groups and then if conditions were right they would rise up in the atmosphere. We do see scum on methane rich waters. A cool humid night just might do it. Collapsing they would then produce a gel that would fall to the ground and soon dissipate. The more interesting question was whether such an assemblage could also get into the Stratosphere, or even survive there. It is certainly hard to see how they might survive direct sunlight in the first instance. Regardless we have a research problem. Simulate methane producing scum and the proper environmental conditions and discover if we get airborne slime molds. This is something that can be done as a school project even in an aquarium with a lid. 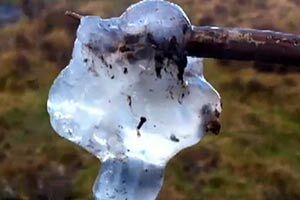 BAFFLED hillwalkers fear ALIENS have landed — after mysterious slime started appearing in the countryside. They have discovered a strange jelly... and some experts believe it’s landed from space. The first report of an unidentified fluid object was in the Pentland Hills near Edinburgh, triggering a flood of similar sightings. Now National Geographic Channel documentary Wild X Files attempts to solve the mystery after they had the weird samples analysed by scientists. Paranormal investigator Steve Mera is convinced he was dealing with aliens after a sample he collected DISAPPEARED. He said: “I was dumbfounded. I had no idea what it was. Euan McIlwraith, presenter of BBC show Out Of Doors, added: “A call came into the studio from somebody who had been hillwalking and found this substance. We knew we were on to something strange. Deer hunter Andy Malcolm thought the goo was stag sperm — but this was ruled out when perplexed fungal ecologist Dr Andy Turner found the samples contained NO animal DNA. Algal researcher Dr Hans Sluiman found it “unlikely” that it was from a plant while Prof Malcolm Kennedy, from Glasgow University, believes the jelly is from frogs used for spawn.